The smartphone sits at the heart of modern China. With the success of AliPay and WeChatPay – both boasting hundreds of millions of users in China alone compared to Apple Pay’s total 127 million users – paying with mobile is commonplace. In fact, card is quite the novelty. Despite the love of mobile, it’s important the Chinese market isn’t considered too narrowly. 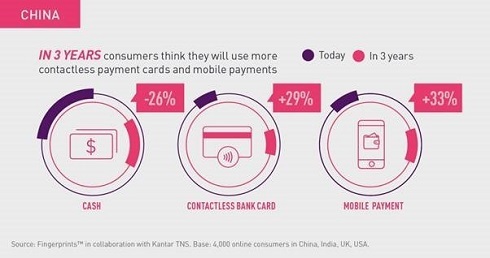 Hungry for rapid innovation and the latest ‘cool’ technologies, China’s payments evolution is unique in that banks, fintechs and companies are increasingly pushing card use as a companion to mobile. But standard chip&PIN won’t cut it for discerning Chinese consumers and biometric payment cards are emerging as the natural partner for a number of reasons. Mobile payments may have taken off initially as a result of the lack of card payment infrastructure, but in recent years, this has started to evolve. The market for payment cards is growing yearly in China, with a majority of these now being contactless, a figure that’s rapidly on the rise. In fact, China UnionPay is now the world’s third highest value card network behind Mastercard and Visa. With a growing middle class and increasing tourism, credit and internationally accepted cards are soaring too. The role of cards alongside mobile payments was also heavily discussed at the first Money20/20 China that took place earlier this month in Hangzhou, the Chinese capital of FinTech and ironically where the paper money was invented 900 years ago. As a presentation from Worldpay revealed indeed 43% of in-store payments in China are with a card. Other traditionally online services are also now taking steps to expand their proposition into offline payments with a card, including AliPay, Walmart China and Uber. The choice of a physical form factor alongside the online and in-app, is demonstrating this combined mobile and card strategy. The jump in card payments can be linked to the dawn of contactless. Offering the same speed and convenience, contactless cards are also free from some of the challenges of mobile payments, such as lack of network coverage, low battery and system incompatibility. Plus, as QR code payments are increasingly susceptible to fraud, concerns are growing among both retailers and consumers. Combined, the case for cards alongside mobile becomes compelling. Consumers get the choice and flexibility to pay dependent on their environment. But there has been a piece missing from the contactless card puzzle until now, strong authentication. Adoption of biometrics is advanced. No doubt a symptom of the nation’s love of smartphones, consumers are already accustomed to biometrics and have largely done away with the passwords and PINs that burden Europe and North America. Bringing biometrics to card payments, then, makes total sense as a familiar and trusted touch point. Fingerprint is the most prolific and preferred biometric authenticator, but others such as facial recognition and iris are also making waves in mobile access control, in-app authentication and even at the point of sale. While fingerprint is the best and only viable solution for card, longer term, biometrics has scope to offer a unifying authentication method for payments across environments and form factors including mobile, wearables, USB dongles and POS terminals. The Chinese market has evolved rapidly and consumes new technology at an equally swift pace. As leaders in embracing eWallets and having driven forward the creation of social app payments, China is making a name for itself internationally as payments innovators and, more broadly, tech giants. Multiple payment terminals at one POS isn’t an uncommon scene in many Chinese retail environments – from supermarkets to street vendors. Consolidation isn’t as important as accepting the latest and greatest payment technology triumphs. For Chinese consumers, possession of the latest technology is a status symbol. With biometric smartcards soon to be the latest ‘cool’ way to pay, it’s not surprising China is tipped to be early adopters of the technology. Biometric payment cards offer the perfect partner to the mobile dominated Chinese market. With initiatives already ongoing, the marriage of mobile and card payments, unified in biometric trust, is set to take over China.